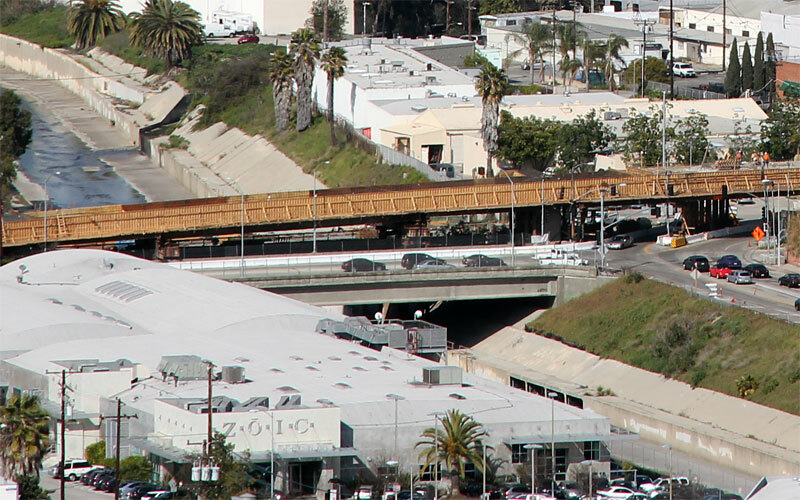 8/22/11 — A test train crosses the Ballona Creek bridge. You can also see the new trees in the median of National Blvd. and the bike path east of National Blvd. 2/17/11 — View east from Hayden Ave.
10/7/10 — Here's another view east of Ballona Creek; the bike path will be to the right of the wall. 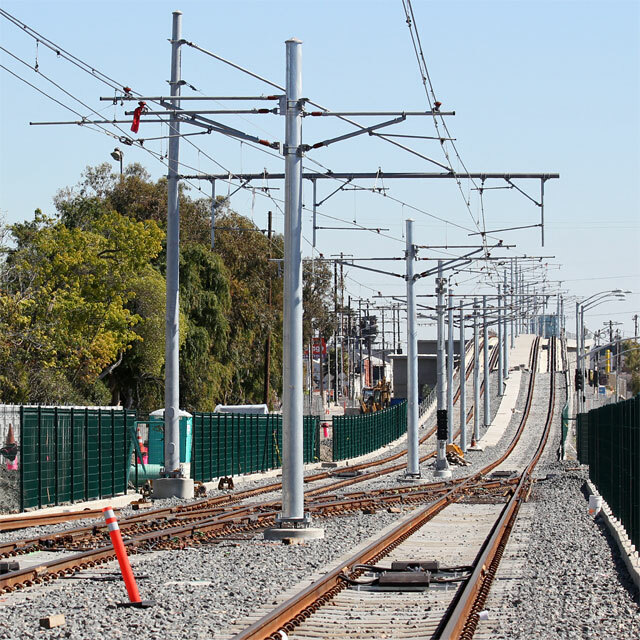 8/27/10 — OCS (catenary) poles have appeared as far west as the Ballona Creek bridge. 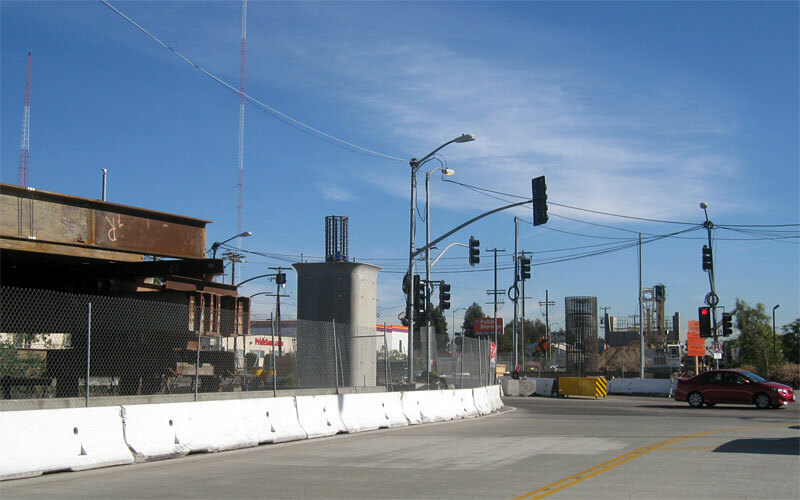 One can expect after the Farmdale crossing is finished that the wire crews will pick up at Buckingham and make it at least through the crossover at Hayden, making it likely the 2011 opening will be all the way to La Cienega. 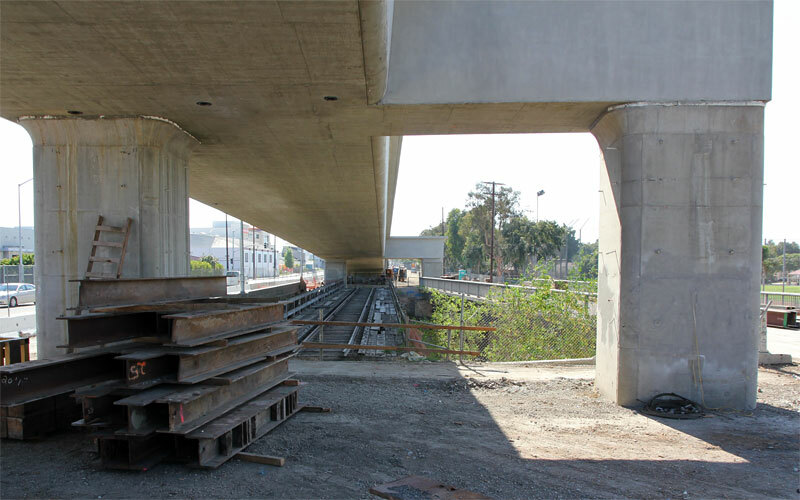 8/9/10 — The view east from Jefferson along the south side of the MSE connection between the Ballona and La Cienega bridges. 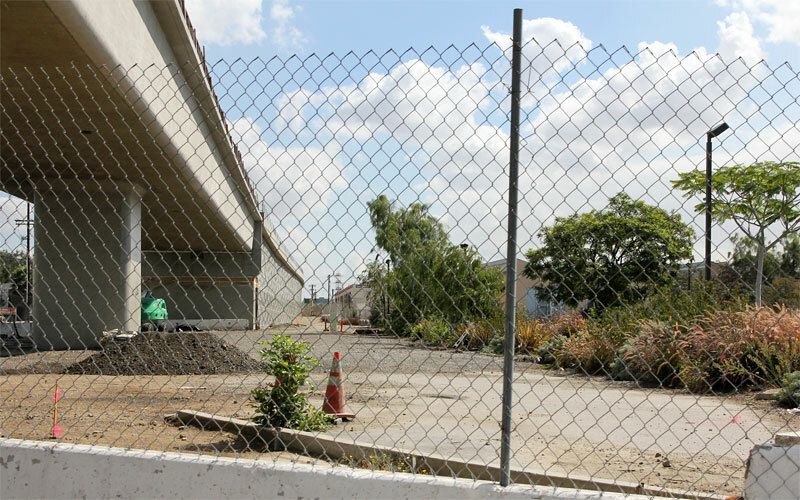 The bike path will be here from La Cienega to Jefferson. 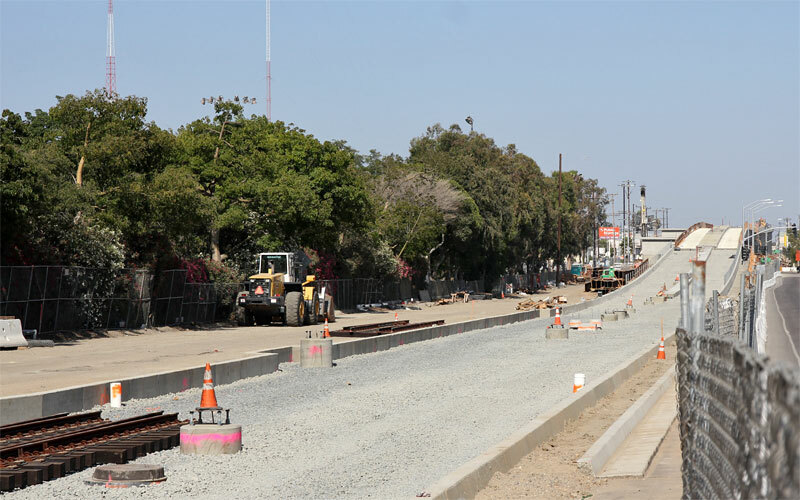 7/24/10 — Rails are nearly finished west from the Ballona Creek bridge; compare with the same view on 7/2/10 below. 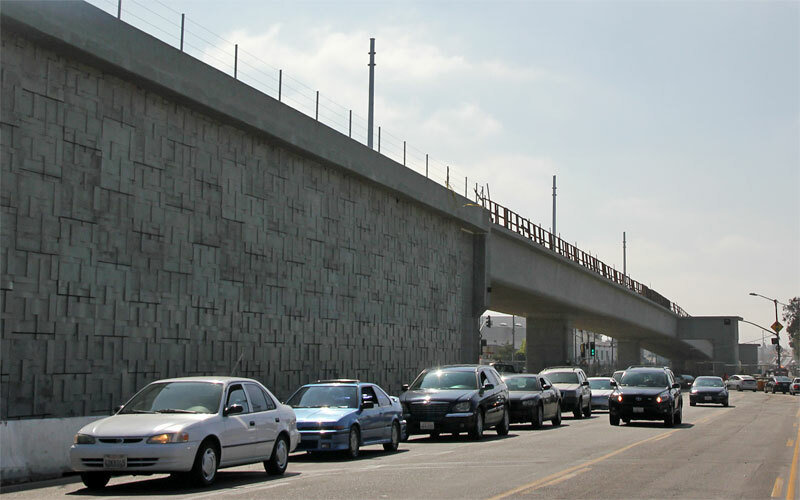 7/16/10 — The old National Blvd. bridge (above, on the right) will become a bike and ped bridge. 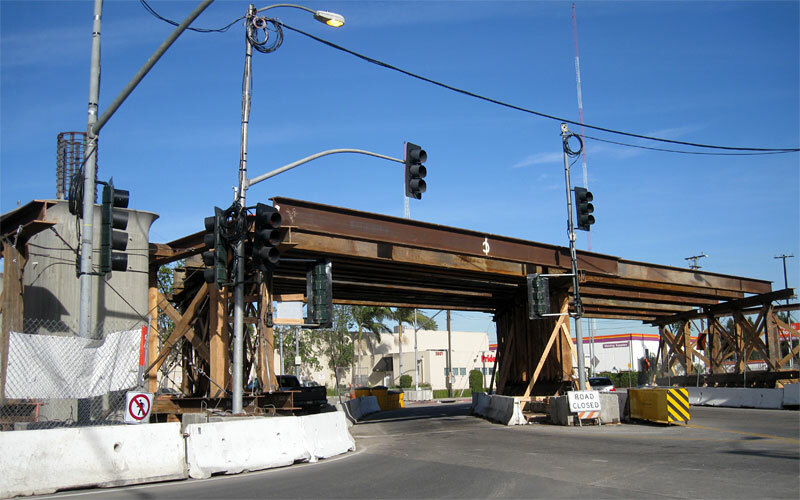 Below is a view of the historic Pacific Electric bridge which will remain below the new Expo Line bridge. 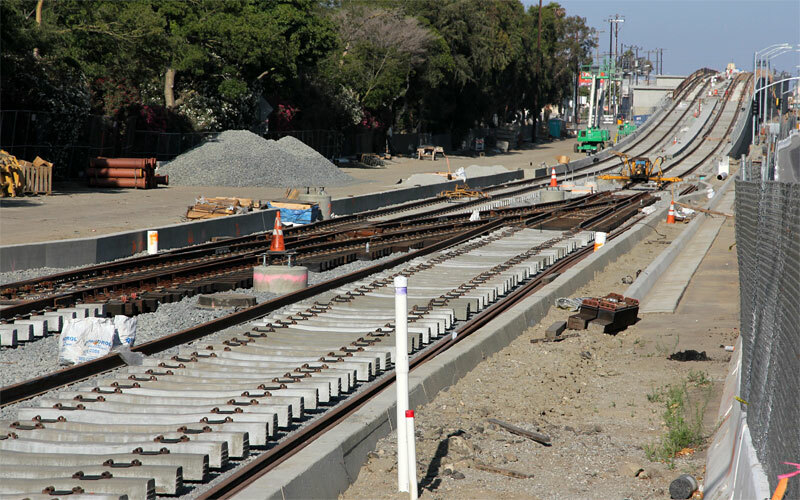 7/2/10 — The trackbed west of Ballona Creek is complete and track switches are beginning to be installed (below). The bike path will go in the empty space to the left. 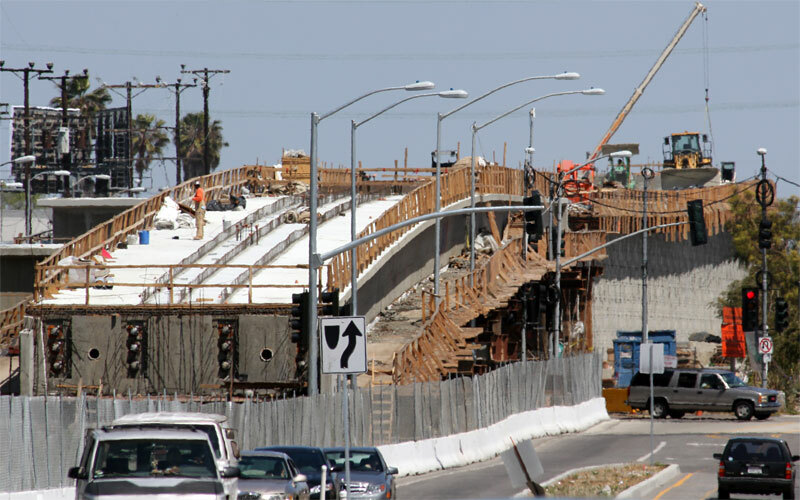 5/23/10 — The falsework is down at the east end of the Ballona Creek bridge (above). 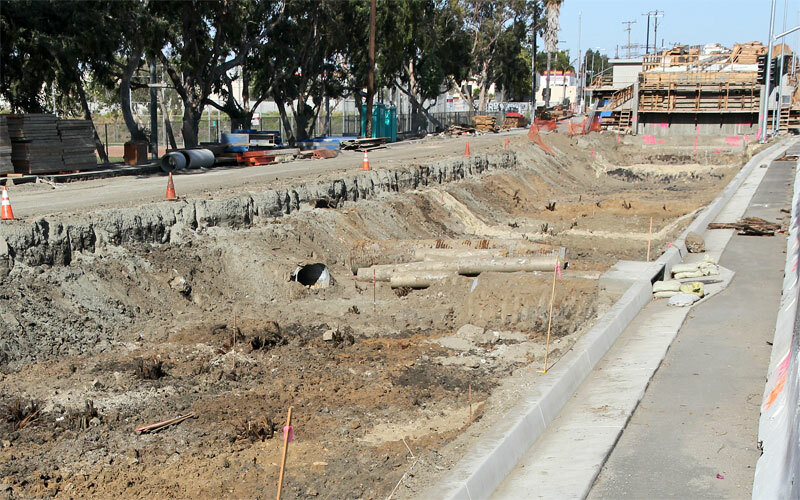 Excavation of the track bed west of the Ballona bridge seems to have uncovered the remains of old wood trestle pilings, both in the left foreground and beyond the concrete pipes (below). 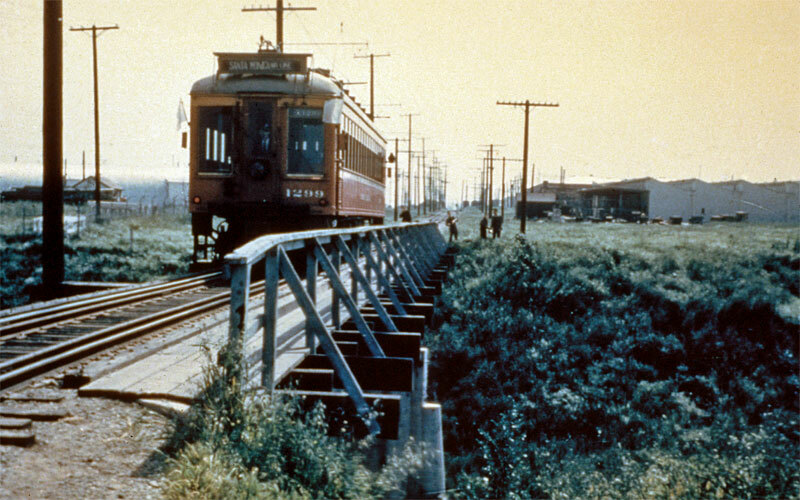 Ballona Creek crossed here before the straighter concrete channel was build in the 1930s (map). 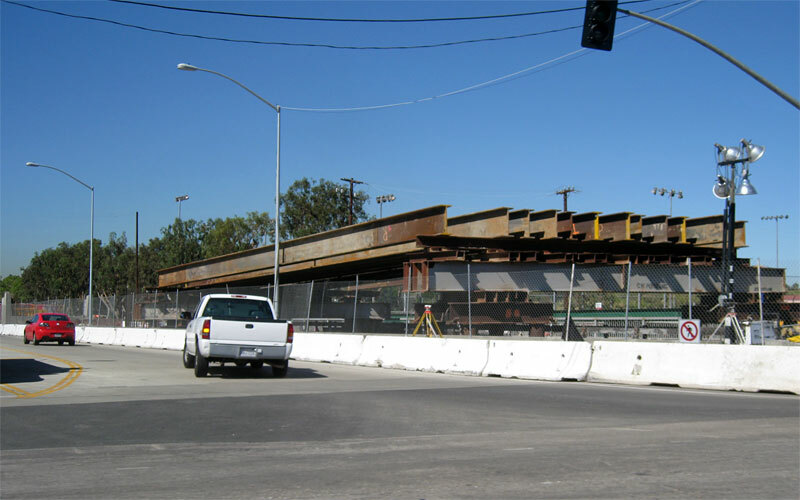 4/28/10  The concrete bridge deck is complete and the side forms have been removed. 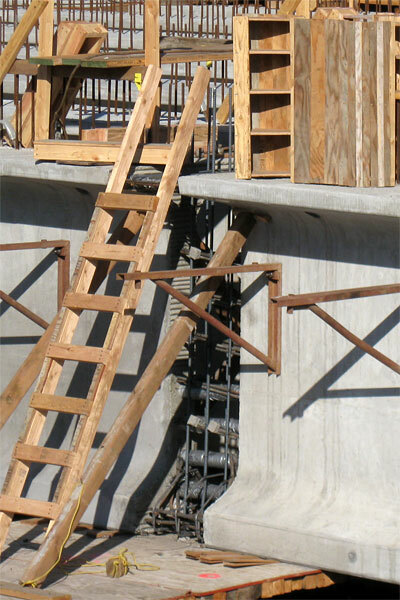 Note the four sets of ends of the tension cables at the west abutment. 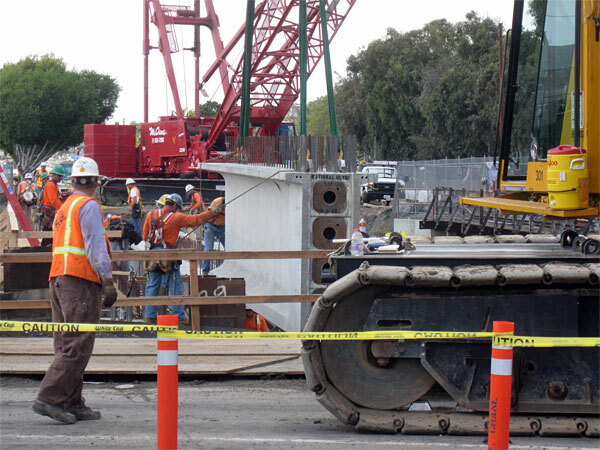 3/10/10  Concrete was being pumped on the western part of the Ballona Creek bridge. 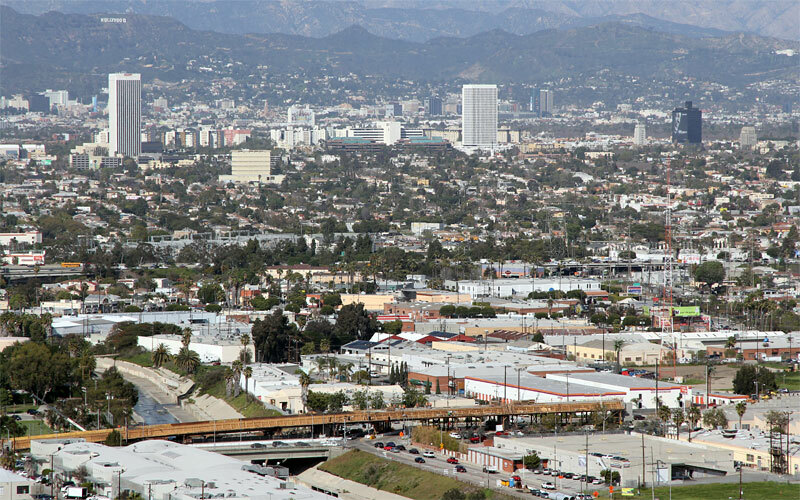 3/10/10  You can see the bridge falsework in this long view from Baldwin Hills Scenic Overlook state park, along with other landmarks like the Hollywood sign and Griffith Observatory (upper right). 2/23/10  Jefferson Blvd. 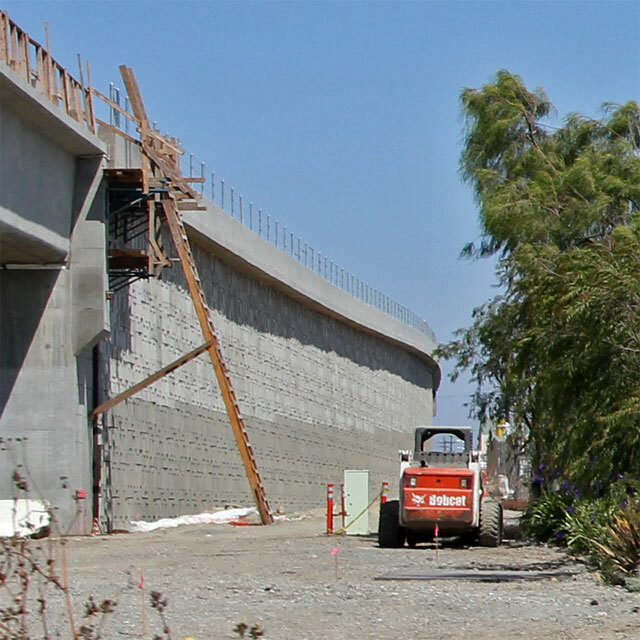 curves south below falsework for the Ballona Creek bridge. 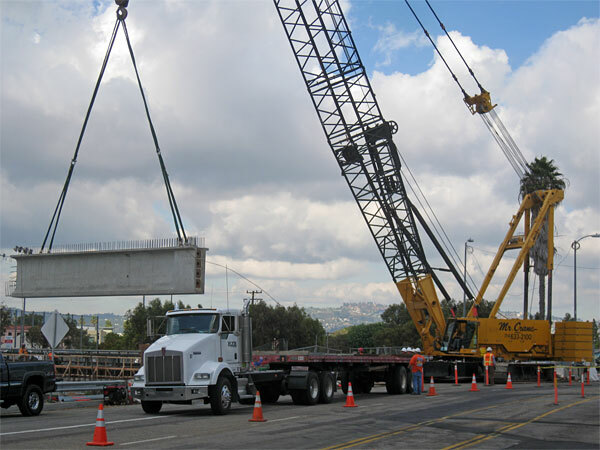 You can see the forms for the straddle bent (big concrete beam) that will connect the two columns on the east side of Ballona Creek. The soil here (old riverbed) wasn't solid enough to support the bridge with single columns. 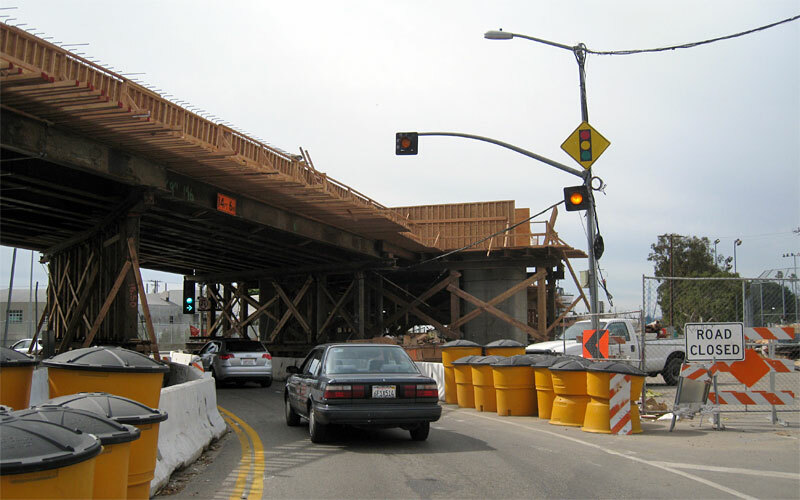 1/5/10  Falsework spans Jefferson Blvd. on the east side of Ballona Creek. 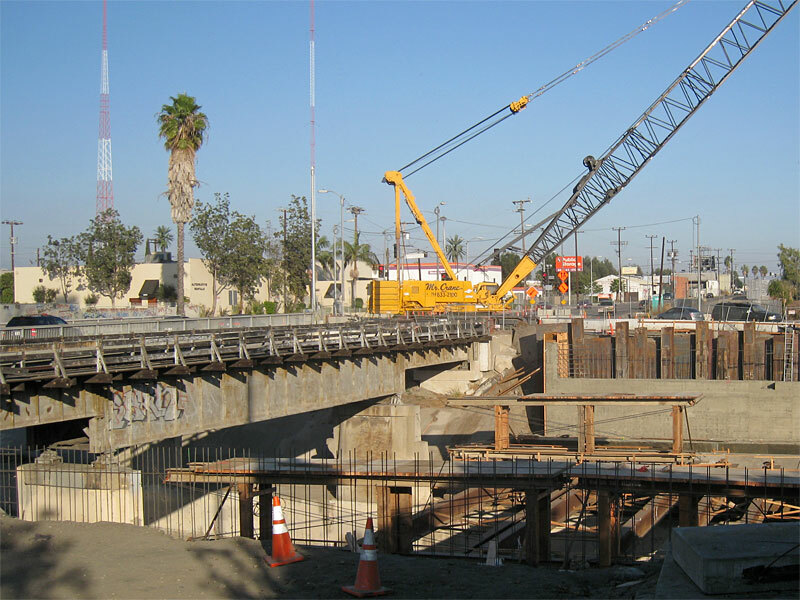 12/18/09  The two columns on the east side of Ballona Creek are complete and the column east of Jefferson is underway. 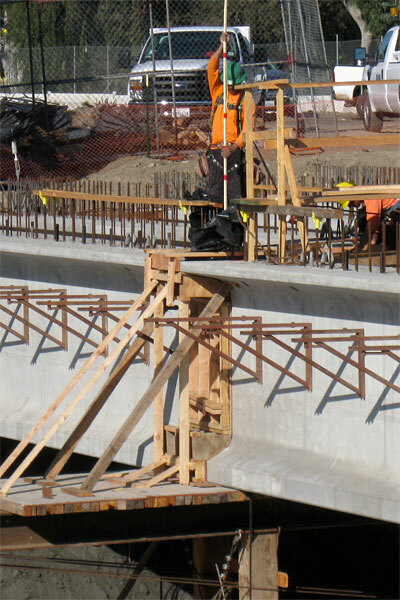 10/16/09  Falsework has been erected above the historic 1938 rail bridge across Ballona Creek. Looking west, you can see four round legs on each side supporting the crosswise beams on each side of the creek. 9/9/09  National Blvd. 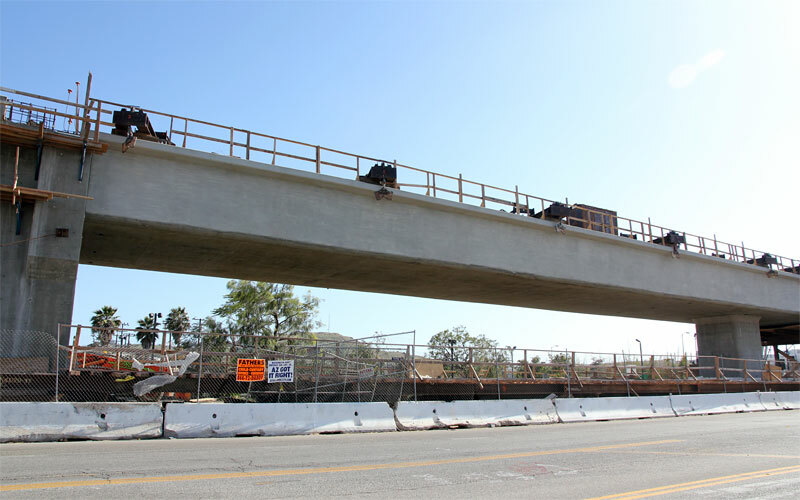 has curbs and pavement, and has opened for traffic in both directions across the new Ballona Creek bridge (the light pavement). 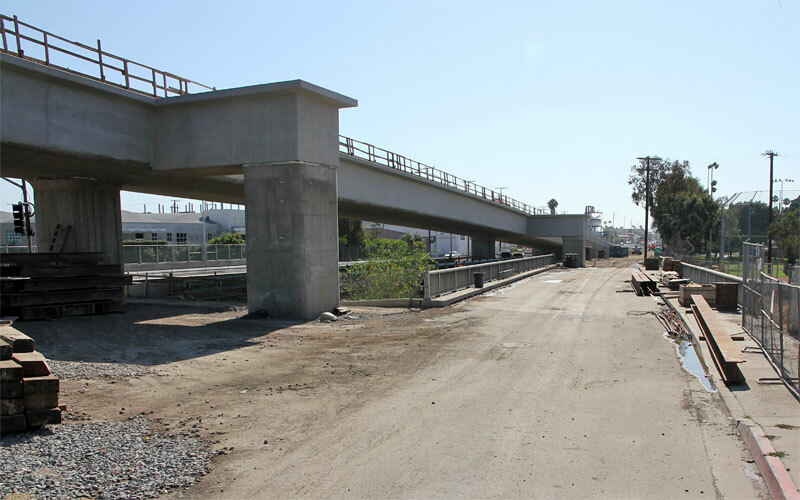 You can also see three completed rail bridge abutments: Ballona Creek west (left) and east (center), and La Cienega west (right-center). 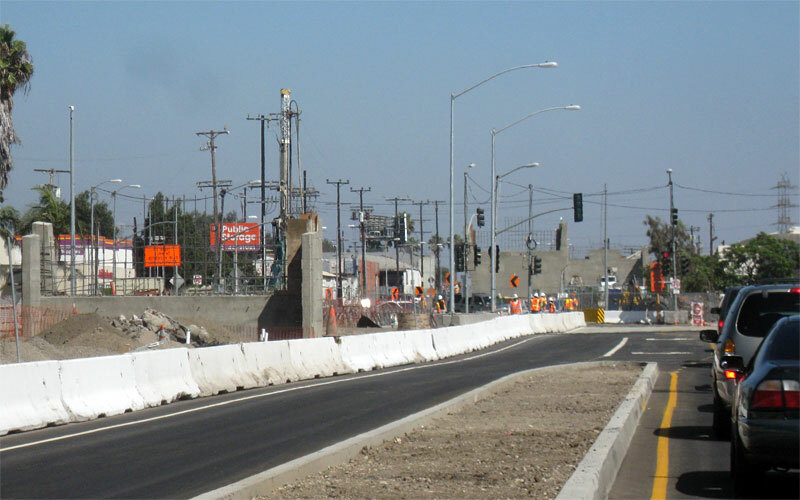 7/3/09  Bridge deck, sides, and sidewalks are complete. 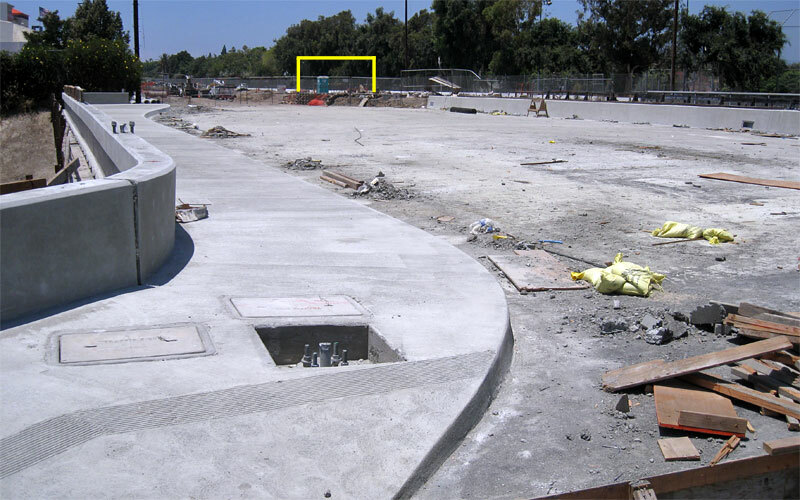 The yellow lines mark the location of the west abutment of the yet-to-be-built ballona rail bridge. 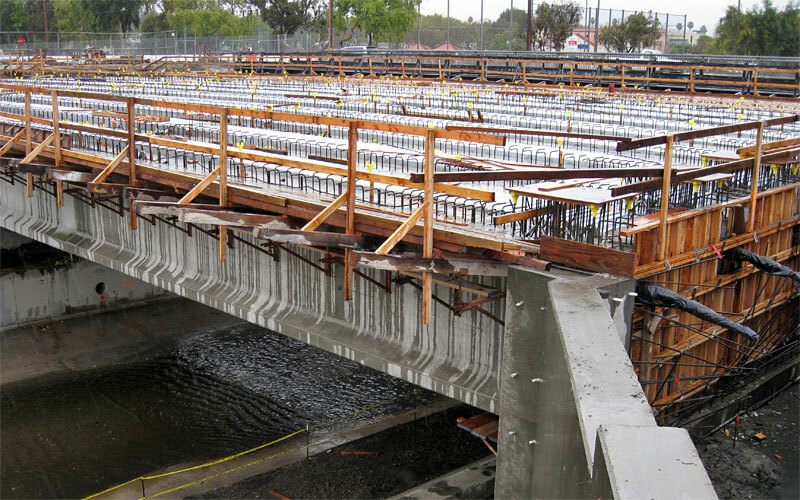 3/27/09  The bridge deck's rebar is in place, ready to pour its concrete. 2/13/09  The temporary supports are gone, the tension cables are installed (sticking out on the right, covered in black), and ribbed panels are in place between the precast girders, moving toward pouring the deck concrete. 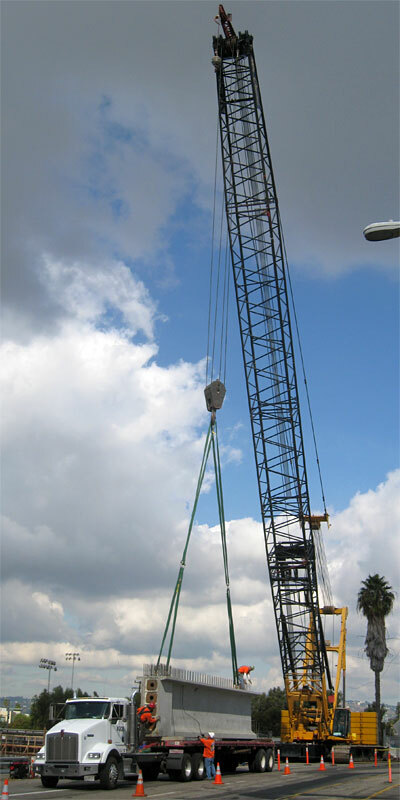 11/18/08  Concrete is being placed to connect the ends of the precast concrete beams. On the left (west side) the forms are ready. 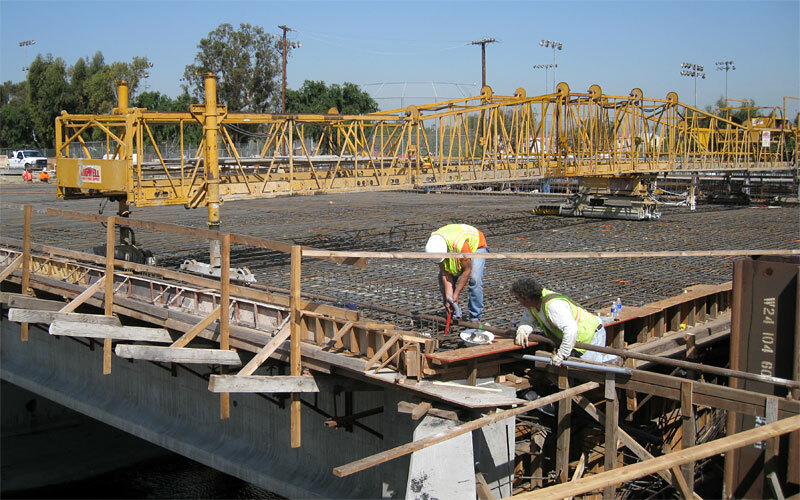 On the right (east) you can see the pipes for the tension cables connected and additional rebar before the forms are positioned. 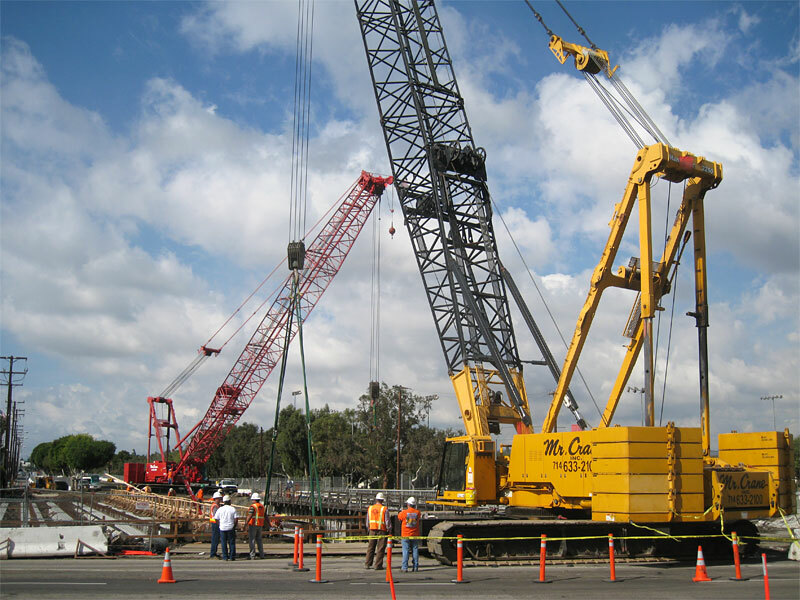 The longer center beams use both cranes together. 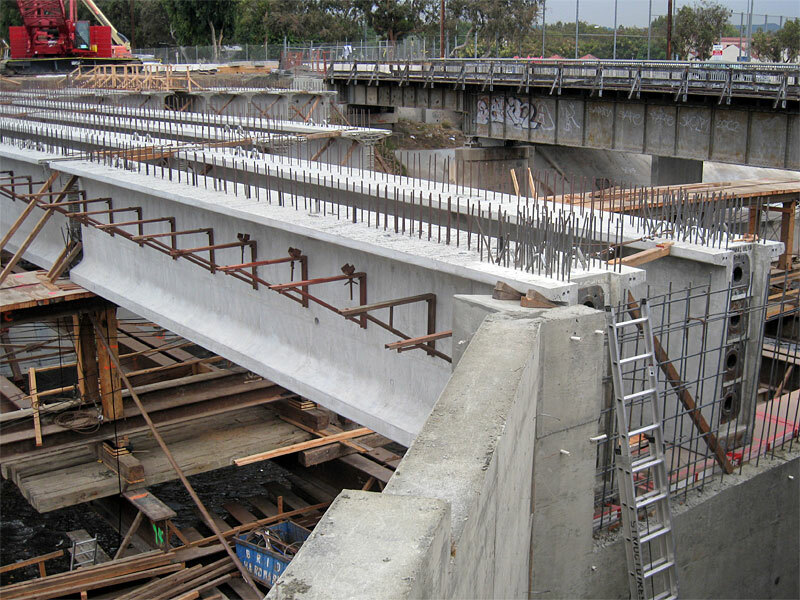 11/1/08  The first precast concrete beams are in place, three sections long, rest on temporary supports. You can see the first two have all three sections; more on the far side only have two or one section so far. In the detail below of the east ends and abutment you can see four holes for tensioning cables to be added and tightened. Note also how the web (the center of the I beam) is thicker at the ends than the center. 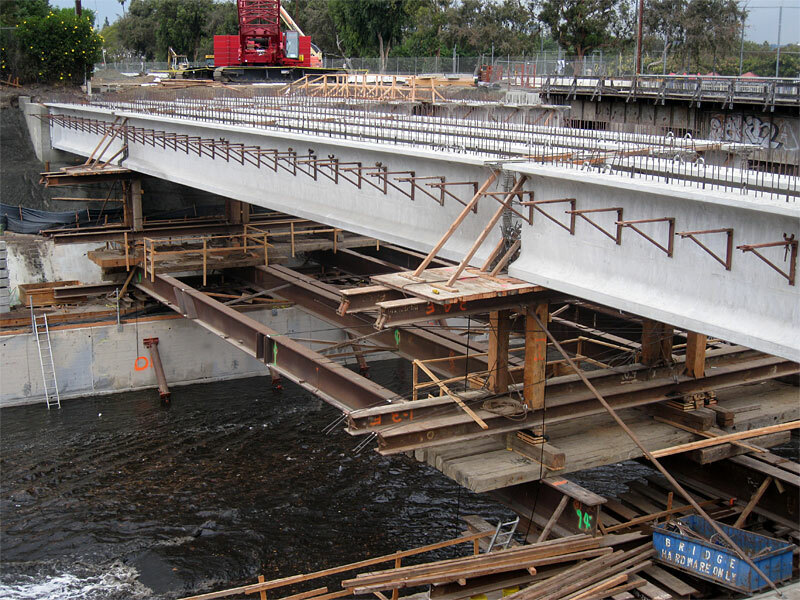 10/26/08  The new National Boulevard bridge construction over Ballona Creek is beginning. 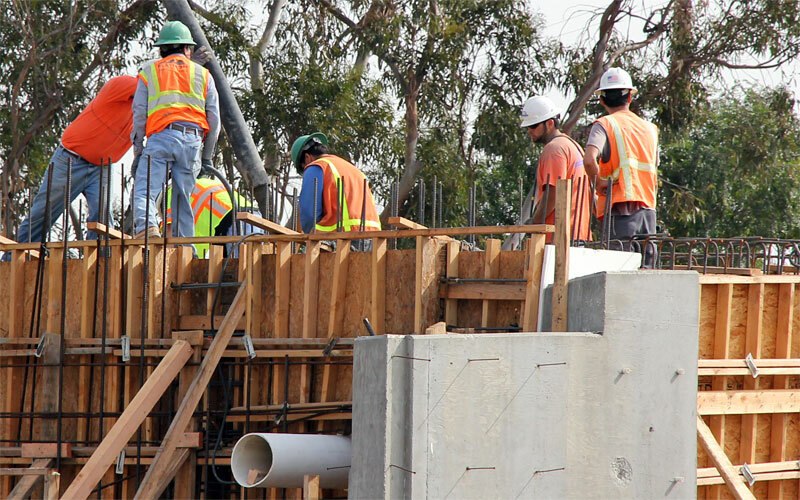 The abutments are partly finished and falsework is being built to support the new bridge. 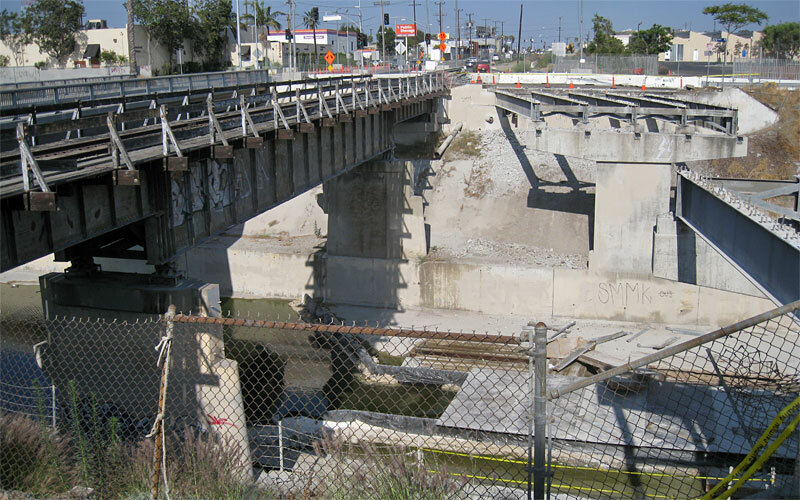 7/19/08  The southern bridge of National Boulevard over Ballona Creek is being demolished. 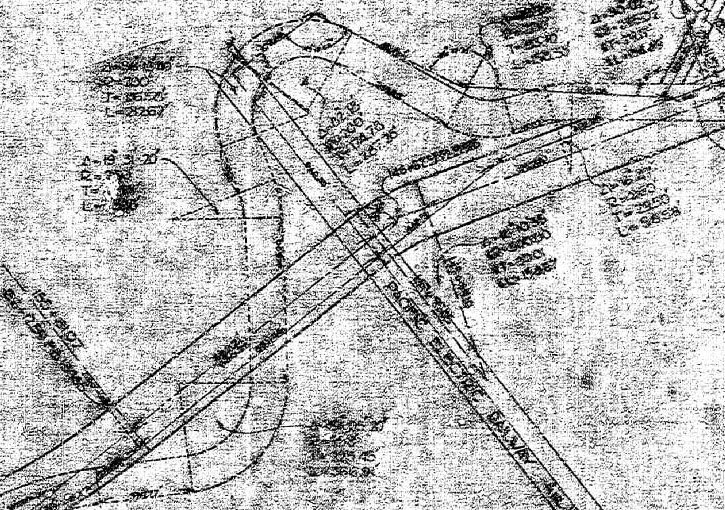 National Boulevard will be entirely on the south side of the tracks, and a new, wider bridge is to be built here to carry all four lanes. 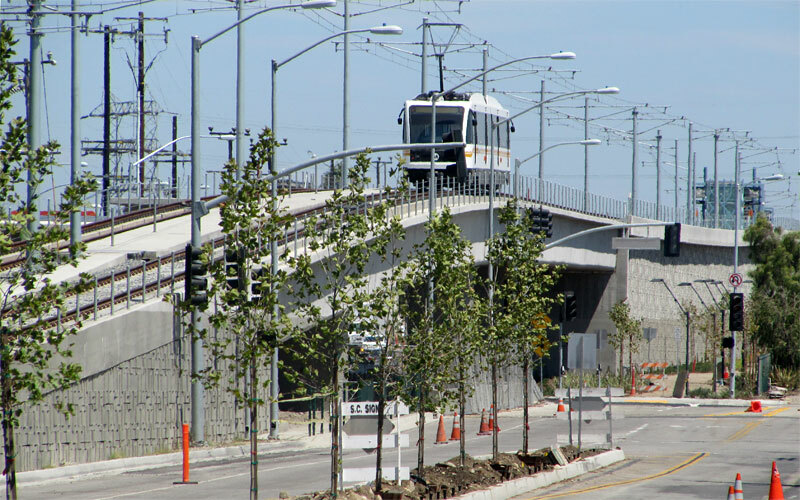 The Expo Line tracks will be on a new bridge, crossing above the new intersection of National and Jeffersion and the historic railroad bridge on the left before coming down to grade before Hayden. 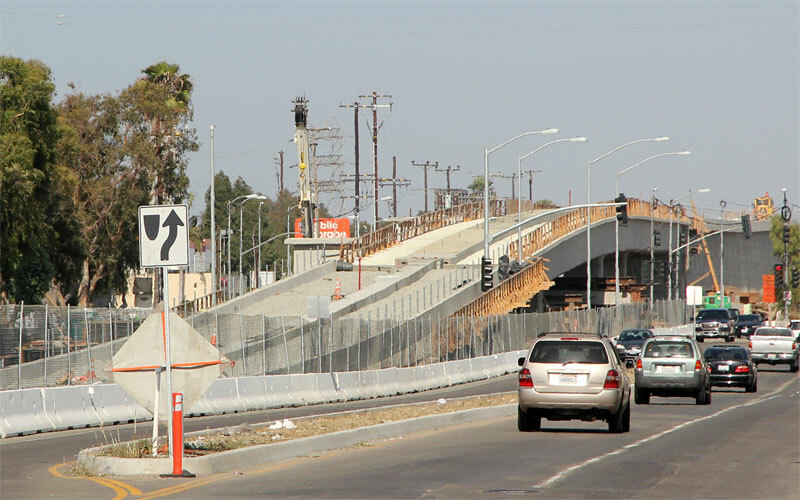 The existing National north bridge over Ballona Creek will be used only for bicycles and pedestrians, which will continue west on the north side of the tracks.